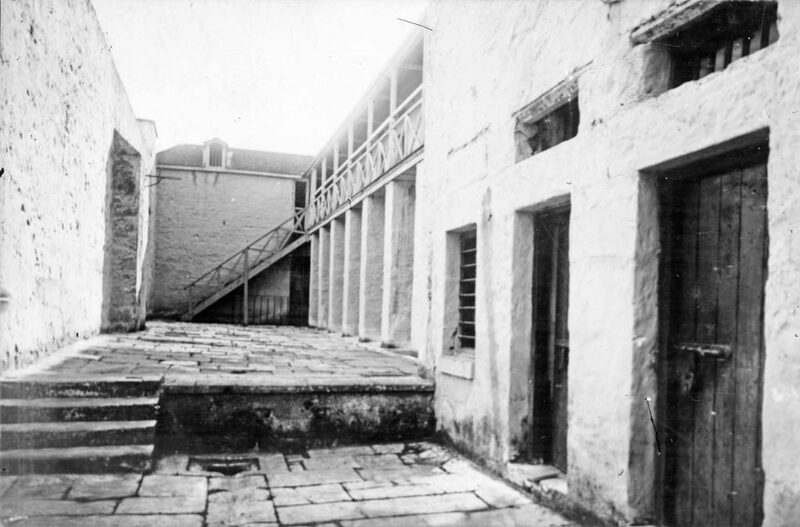 The Cascades Female Factory – sometimes called the “Female House of Correction” operated between 1828 and 1856 (it kept operating as a gaol until 1877). Convict women were sent here for many reasons. They might be waiting to be assigned to a new master, waiting to give birth, breastfeeding a new baby, or being punished. As the Tasmanian historian Alison Alexander has pointed out, these women were caught in an impossible double-bind. 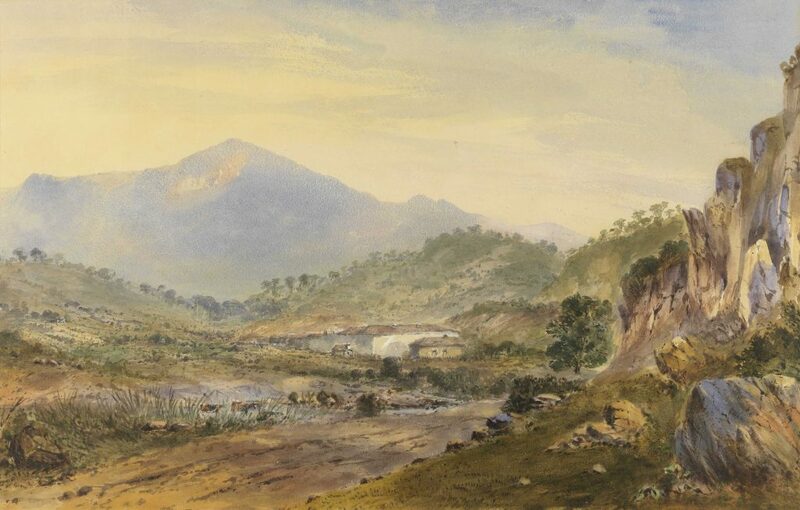 Many had grown up in deep poverty in the United Kingdom “living despite the rules, getting round the regulations, making do.” Caught in the judicial system and transported across the world to Van Diemen’s Land, they were assigned to free settlers as unpaid servants, and expected to be docile, obedient, clean and tidy. Unsurprisingly, many rebelled – getting drunk, talking back, having relationships with men (and women), and running away. One woman, Unity Rafferty, was caught in men’s clothes and trying to join a whaleship in 1849. When they were caught, they ended up facing the sandstone walls of the Cascades Female Factory, in the cold shadow of the mountain. The main entrance to the Cascades Female Factory. 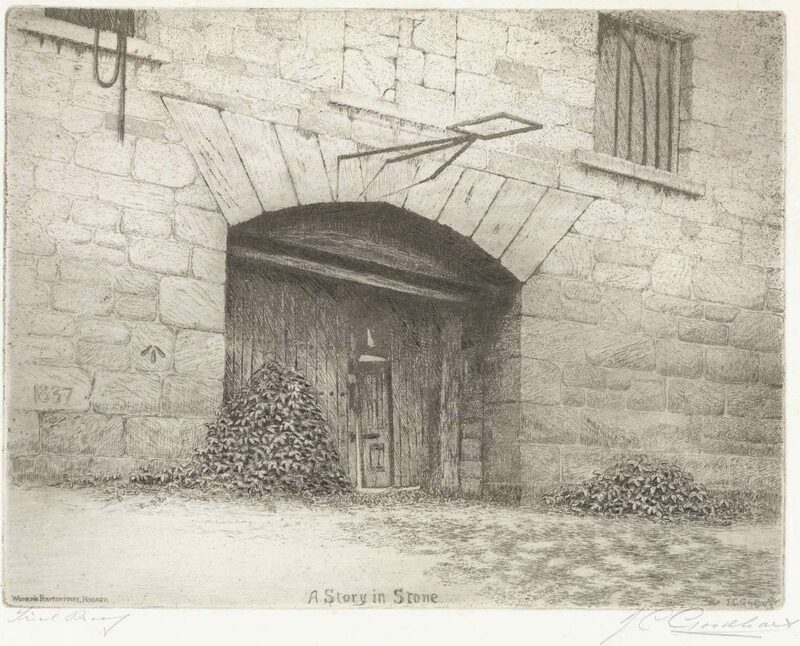 J.C. Goodhart, a Story in Stone, Women’s Penitentiary Hobart. ALMFA, TAHO. When these women entered the factory – often pregnant or with small children in tow – they were expected to work. The idea of the factory was that putting convict women to work would grind into them habits of “cleanliness, quietness, regularity, submission and industry,” according to the Rules and Regulations for the Cascades Female Factory (1829). Those who were well-behaved or waiting for assignment got easier jobs, like spinning wool or needlework. Very little of their handiwork survives, but some of the women were very highly skilled. The incredible Rajah Quilt,which was embroidered aboard the convict ship Rajah and gifted to Lady Jane Franklin in 1841, is now recognised as a national treasure. Those who were being punished for “secondary offences” were given hard labour, like washing clothes or picking oakum. But as historians of the Factory have noted (see the reference books below) there was never enough work at the Factory to keep all the women employed, and often they wandered aimlessly about the overcrowded yards. Women’s experiences of the factory differed widely. For some, it was a a place of fear, pain, and sorrow – not least because of its appallingly high rate of infant mortality. Out of the 794 babies born at the factory between 1830 and 1838, 208 infants died (26%). But for other women, the institution was a place to meet their friends, to play cards, to joke and make fun of the establishment that kept them there. Some went to the Factory once, and never returned. Others cycled through, on regular stints of a few days to months. For some, it might well have been a place of refuge, especially if they were sent there by abusive masters. But getting a glimpse of life inside the factory – of its crowded spaces, of the women and children who lived there, of where they came from and how long they stayed – can be tricky. And that’s where our new digital volunteering project comes in, and how you can help. 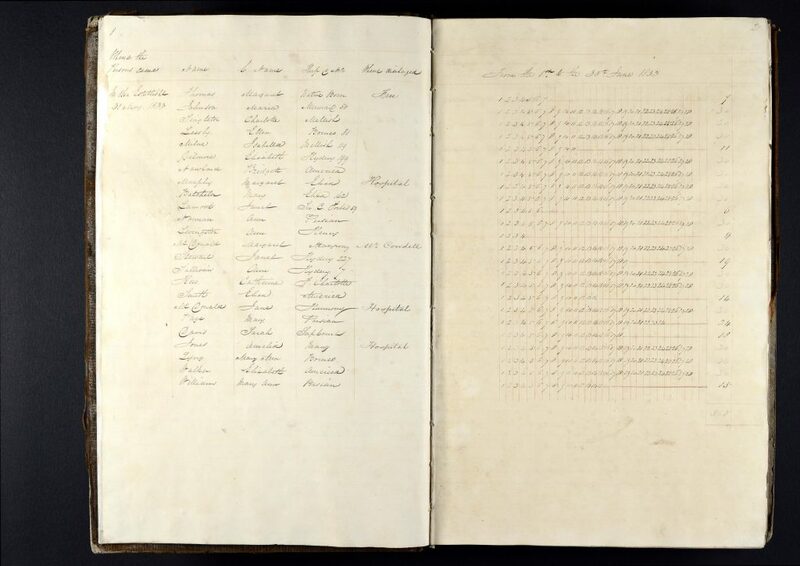 Our newest digital volunteering project is an effort to transcribe CON139/1/1 – the Register of Female Convicts admitted to the Factory. This register documented when women arrived in the establishment, when they were discharged, and where they went. It is a real treasure trove of information, not least because it also documents all the children in the establishment during this year, from newborn babies to eleven year old girls. Some of this information isn’t recorded anywhere else, so it’s invaluable to family historians and academics alike. While the document can be a bit tricky to read (especially the pages that deal with the children, where the ink has faded badly) it is worth it. When all of the data has been transcribed, we’ll upload it to our Tasmanian Names Index. Then researchers in Tasmania and around the world can find out more about these women’s and childrens’ lives. You can join our DigiVol expedition to transcribe this register and other priceless archival documents! Just go to DigiVol at the Atlas of Living Australia, look for the Libraries Tasmania projects, and join up here! Be aware, though – digital volunteering can be addictive! There is so much more to find out about the complex history of the Cascades Female Factory, from the women’s lives, to the convict system, to the history of the buildings and the neighborhood. Consider this a jumping off point, a start to your own research journey. Below, you’ll find links to digitized archival resources available at TAHO, world-class books available from Libraries Tasmania, and links to other organisations dedicated to telling the stories of Tasmania’s female convicts. This is only the tip of the iceberg. If you’d like to find out more, please come and visit us at 91 Murray Street in Hobart, at any Tasmanian library, or give us a call! We’d love to hear from you! A series of reminiscences of George Pullen, who was the assistant superintendent of the Factory from 1828 until 1831, as published in the Launceston Examiner in 1892. You can find more fascinating primary sources, including many newspaper articles which you can find on Trove, by looking in the bibliographies and notes of our reference books (see below). Lucy Frost and Colette McAlpine, eds. From the edges of Empire : convict women from beyond the British Isles. (Hobart: Convict Women’s Press, 2015). 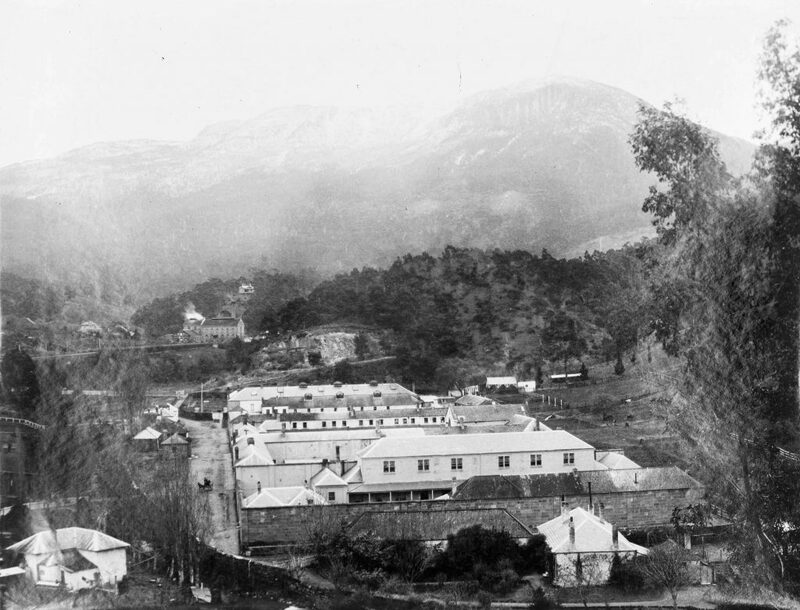 The Cascades Female Factory Historic Site is on the World Heritage List, as the most significant site associated with female convicts in Australia. You can visit them in person in South Hobart, or online at their website. * In case you’re curious about Unity Rafferty, she’d been convicted in South Australia in 1846 (with a baby at the breast) for telling fortunes and defrauding her customers. You can read her whole convict record in our Tasmanian Names Index. Thanks for this post. I checked out this ‘expedition’ on the ALA site: it’s actually completed now (https://volunteer.ala.org.au/project/index/28828881) though I realize that your post here went up in August. So, although I’m late to this particular party, I’ve signed on and created a profile. The work looks fantastic and I had no idea about this resource. So I’m doubly grateful to you. I see that the Colonial Secretary Index is underway. There’s also some terrific work from the Indigenous Ecological Knowledge folks.